Where are the Jehovah’s Witnesses Right? 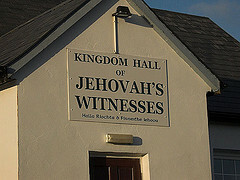 While the Living Church of God rarely owns church buildings, Jehovah’s Witnesses normally do. Many in Western nations get periodically bothered by people coming to their doors who are from the group called “Jehovah’s Witnesses” (JWs). And while this group teaches many errors, perhaps it may be of interest to understand that they do have some correct doctrines. There were other beliefs above, such as baptism by immersion that the LCG agree with, that were omitted because the way they were worded at the official JW website was not how the LCG would word them. Regarding crosses, perhaps it should be mentioned that while we in the LCG generally understand that the word translated as “cross” normally means tree or stake, that it is possible that a cross was used for Jesus’ crucifixion. However we, like the JWs, are opposed to in any way revering crosses and we in the LCG have been so opposed throughout history (please see the article (The Pergamos Church Era). Both the Jehovah’s Witnesses and the LCG believe that the true church would be a “little flock”. Both the Jehovah’s Witnesses and the LCG believe that the true church would suffer persecutions throughout its history. Both the Jehovah’s Witnesses and the LCG believe that abortion violates the commandment against murder. Both the Jehovah’s Witnesses and LCG claim to get their doctrines from the Bible. Both are opposed the Christian observance of non-Christian, repackaged pagan holidays such as Valentine’s Day, Easter, and Christmas. Both groups believe that Passover is to be observed once per year on the evening of Nisan 14 (though the Jehovah’s Witnesses actually do not seem to understand when that is as they get it off by a day or so each year). Both the Jehovah’s Witnesses and LCG reject the pagan concept of the immortality of the soul. Both groups avoid worldly politics. The Jehovah’s Witnesses prefer neutrality to worldly matters. Those in LCG do not serve on juries or nor vote in governmental elections (please see the article Should a Christian Vote?). The Trinity is not a teaching of Jesus or of the early Christians. (Is Jesus Christ God? http://www.watchtower.org/e/20050422/article_01.htm 070707). But although the above is true, scripturally it only proves that the Son is under the authority of the Father–which is also the binitarian LCG position, it does not prove unitarianism (which is the position of the Jehovah’s Witnesses). The Holy Spirit is a force, Reasoning from the Scriptures, 1985, pp. THE HOLY SPIRIT God is Spirit. The Holy Spirit is the very essence, the mind, life and power of God. It is not a Being. The Spirit is inherent in the Father and the Son, and emanates from Them throughout the entire universe (1 Kings 8:27; Psalm 139:7; Jeremiah 23:24)” (Official Statement of Fundamental Beliefs. LCG, 2004). Most in mainstream churches have never studied what the early Christian church taught about the Holy Spirit and do not realize that the current trinity doctrine was not accepted by their predecessors until 381 A.D. Documentation of this is included in the articles Did Early Christians Think the Holy Spirit Was A Separate Person in a Trinity? and Did the True Church Ever Teach a Trinity? Although both groups believe that God created everything, both groups believe that the universe is billions of years old (Your will Be Done on Earth, p. 43. Cited at carm.org). The LCG teaches that there was a major amount of time, perhaps billions of years between Genesis 1:1 and 1:2 (e.g. Armstrong HW. Mystery of the Ages. pp. 74-75). Partially because of their teachings against the pagan concept of the trinity, both groups tend to be classified as “cults” by those who accept mainstream Christianity. Members of both groups have been mistreated in many ways by those of mainstream Catholic and Protestant churches. Both groups realize that the name of God in the Old Testament is not “LORD” as nearly all Protestant translators have rendered it. However, instead of “LORD” Jehovah’s Witnesses prefer to use the term Jehovah (which is a remotely possible, but not likely pronunciation of the Hebrew– Yawveh is probably closer to the original), while those in the LCG tend to translate the Hebrew word into its original meaning, like Eternal or Self-Existing. Both groups believe that this current world is essentially Satan’s world, that the Bible teaches about the resurrection, and that there will be a “Thousand Year Reign of Jesus Christ” (Pay Attention. p. 290). Early Christians understood their obligation to be “no part of this world.” Hence, whenever civil uprisings or military conflicts occurred, Christians remained neutral. They pursued peace with everyone.—John 14:26; 18:36; Matthew 6:9, 10; Acts 2:1-4; Romans 12:17-21 (United by LOVE OF GOD. Official Website of the Jehovah’s Witnesses. http://www.watchtower.org/library/w/2005/1/1/article_02.htm 07/08/07). More details, including the position of those who professed Christ in early centuries, is included in the article Military Service and the Churches of God: Do Real Christians Participate in Carnal Warfare? Both the Jehovah’s Witnesses and LCG have church services that last approximately two hours (though the Jehovah’s Witnesses do it on Sunday, while the LCG does it on Saturday–both groups have other meetings/services as well). Both groups believe that God is only calling a relatively few now, but that ultimately, all will be called and most will be saved. Even though this is a biblical concept (for documentation, please see Universal Salvation? There Are Hundreds of Verses in the Bible Supporting the Doctrine of True Apocatastasis), it has been condemned by Protestant leaders (please also see Hope of Salvation: How the LCG differ from most Protestants). Am I trying to encourage people to become part of the JW movement? No, I do not believe people should become part of the JW movement. The purpose of this post is to help readers to better understand why the JWs have the dedication that they do, as it is important to realize that they do have a lot of doctrinal understandings that are correct. 19 For though I am free from all men, I have made myself a servant to all, that I might win the more; 20 and to the Jews I became as a Jew, that I might win Jews; to those who are under the law, as under the law, that I might win those who are under the law; 21 to those who are without law, as without law (not being without law toward God, but under law toward Christ), that I might win those who are without law; 22 to the weak I became as weak, that I might win the weak. I have become all things to all men, that I might by all means save some. (1 Corinthians 9:19-22). The JWs also have a lot that are wrong. But in order to reach them, it can be helpful to understand that they (like nearly all religions) have some of the truth. And that is the purpose of today’s post. Similarities and Differences Between the Jehovah’s Witnesses and the Living Church of God Both groups claim to represent the original Christian faith. Do you know much about them? Both groups have some interesting similarities, but many major differences. Would you like information on how to deal with Jehovah’s Witnesses? This entry was posted on Tuesday, January 6th, 2009 at 6:36 am	and is filed under Doctrine.